I promised a couple of posts ago that I’d follow up on the post about Adding a Border to Your Plan. Today I’ll show you how to take the border we created and make it into a Library Object that you can use and re-use in any plan you create. 1. Open the Ez-Architect file where you saved the border. 2. Be sure your border (or other object) is selected. If it’s not already grouped, group it and then select it. 3. If you already have a library file with your own custom objects, that’s good. You can add this new border object to it. If not, go to Options/Library/Create New Library and create a new library file. Depending on the permissions on your computer, you may need to change permissions for the Library directory if you want to add your own file there. This can be done. Otherwise, just put your custom library file in your My Documents directory, or with your other Ez-Architect data files. Your Library file will be an *.aal file. Your Ez-Architect files are *.aad files. 4. Next select the object. (Read 2, above again if you haven’t grouped it). 6. The default Library directory will open. If you have placed your new library file there, find it and click. If your *.aal file is somewhere else, then navigate to it and then click the file. 7. To make sure your border is now in your library file, go to Options/Library/Manage Library. 8. When the Manage Library dialog opens, click Open, navigate to your library file via the file dialog and then open it. 9. You’ll see your border as an object in the library. You can use the Rename option to give it a name. Then save. 10. To use your border, click the Library icon Tool and draw a rectangle, the Library file dialog will open where you can select your library file (or navigate to where you saved it). Click to open. 11. Double click the library object. Click done, and it will be placed in your drawing. Drag it so it’s the size you want. Are you having trouble Registering Ez-Architect ? We’ve had a couple of incidents where users have had some trouble registering Ez-Architect. Did you see something like this? Do you see this when you try to register your key? Check to see what version of Ez-Architect you are using. Go to Help/About. This will operate whether you’re using the demo or have an older registered version. If you have a version prior to 6.0, you should not be seeing anything like the message, above. If you do see this and you’re trying to register an old version, contact us and tell us about it. We’ll find it very interesting… and strange. And then we’ll encourage you to upgrade to version 6. Be sure to uninstall any previous version. Ez-Architect should be in full operating mode. You might be wondering how to get the latest and greatest and what will happen if you’ve already registered. This is not a problem. If you’d like to upgrade to version 6.2 from 6.0 or 6.1 and you’ve already successfully registered, follow the instructions above (Solution A). But skip step 6. Your software will automatically be in full version (not demo) mode. When you register Ez-Architect, it contacts a special server that records your email address and Ez-Architect key. A few months ago, we switched to a new server and so Version 6.2 of Ez-Architect was set to contact the new server. Earlier versions were set to contact the old server, which alas, is no longer there. 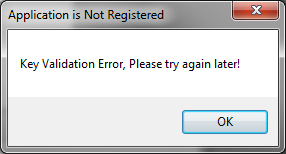 So if you try to register version 6.1, it cannot do it, and you get the friendly message above when you try. There is one other possible reason that you might see the message above: Sometimes your firewall will block you from connecting with our server. If this happens, please try to set your firewall to allow the connection and try again. If it’s still a problem contact us and we’ll assist you. In some circumstances, depending on what you are drawing, you might want to add a border. In fact, you might want a standard border for all of your plans, kind of like a logo or a way for your customers/clients/friends to quickly identify that the work they’re looking at is from you. Almost like a trade mark or identifier. There is no specific border tool in Ez-Architect. But there are plenty of tools included that make creating a border easy enough. You can even create a border and save it as a library object so you can use it over and over. You can create several different borders for different types of projects. This is simpler than you’d want for a special saved border. But it’s a good place to start. Here’s the border, now in blue with a thicker line. Note, the fill is still empty, but now your corner color indicator shows up in blue. You’ve made the simplest border of all! Next I make an arc pie. The little Arc Pie, selected. Use Ctrl 2 and Ctrl 1 to rotate the arc into a new position. And next, I duplicate it 3 times. I experimented with a variety of fills for this pattern. But I like the dynamics of how it looks “empty.” Fills made it look flat. But you can certainly experiment, and depending on what object shape you begin with, a fill pattern may be just what you need for your own unique border. Fill the pattern if you wish and then continue to group and duplicate it until you have a complete border. You’ll have to rotate it a couple of times, too. Here’s the complete border. After positioning everything, I did group it. I didn’t want any of the segments to go astray. Complete Border. The right, left, and bottom were rotated and/or flipped. One more thing (as Colombo was wont to say). Be sure to place the border on its own Ez-Architect layer. That way it won’t interfere with other objects in your drawing, nor they with it. Next time, we’ll look at saving it as a library object that you can bring into any new plan. Ez-Architect 9 Has Even More Great New Features! Version 9 includes two keys so you may use it on a tablet and a computer. Can draw using finger or pen on Windows 8 Tablets, including Microsoft Surface models. New interface with color and pattern palettes. 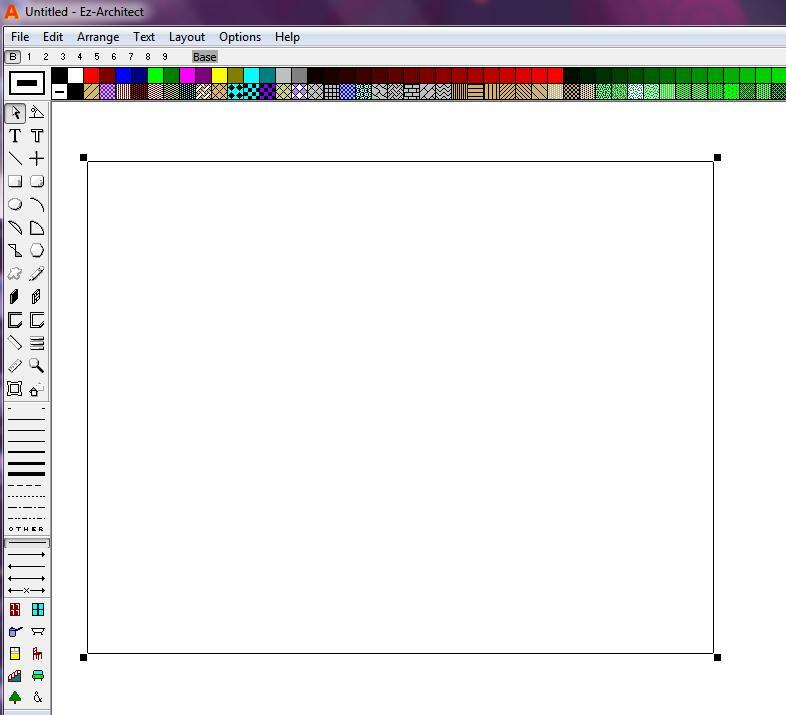 Also can choose to display large palettes when using Windows 8 tablets or high resolution screens. This setting can be selected in the Prefences dialog. Problems with some dialogs not displaying correctly on high resolution screens fixed. New larger library window which displays multiple rows. New “Show Only Selected Objects” in the Layout menu. Choosing this hides all objects which are not selected. This is useful for printing or exporting only specified parts of the drawing. Choose “Show all objects” in the Layout menu to display the entire drawing again. Four new items in the Arrange menu (Left Alignment, Right Alignment, Top Alignment and Bottom Alignment) allow arrangement of selected objects. First select the items you wish to arrange and then select the desired alignment option. These dialogs can now be displayed by double-clicking on items in the Pattern and Color palettes. When Large palettes is set in the Preferences dialog, three Key Buttons display at the top right of the screen. These can be used in place of the keyboard keys when using a tablet. Tapping the Shift and Ctrl key buttons is the same as holding down the Shift and Ctrl keys. Tapping these buttons again releases the keys. Tapping the Delete key button deletes any selected objects. These keys do not work when clicked with a mouse. The Assist Key menu can be used in place of the key buttons. Some features of this home design program that make your floor plans easier are the duplicate tool for automatically placing rows or columns of boards, studs, trees, plywood, joists or whatever exactly where you need them—spaced on-center like you need them when you design your own home. And there’s a layering system for keeping upper stories, electrical, and plumbing schematics separate. On the other hand, if you just want to create simple floor plans without any complications or layers or construction detail, this is the home design program for you! Did you try it yet? Try out the new features to see if you can’t live without them. What features are you fond of in the new version? We also have special prices now for a second or third “copy.” Buy your first copy at the regular price of 19.99, and get a second copy for just an extra $2 or a second and third copy for $4. What a deal! All with new Continuous Wall and Continuous Hollow Wall icons, too. Can you pick them out? This isn’t a long list, but it’s a powerful one. We will continue to make improvements and welcome your input on features you would like to see in future versions. You’ll find a complete features list here, which includes Ez-Architect version 5 changes as well, in case you’re still working with version 4. What features would you like to see in future version? What’s your favorite feature about Ez-Architect (any version)? Visit here to purchase the new version of Ez-Architect. Or go ahead and download the demo to try it out. It’s easy to add a photo to your plan. This is especially useful if you’re doing some remodeling and you want to see how the remodel changes the look of your elevation(s). If you can’t get a square shot, you can use an angle shot, but your plan will be more of a drawing than a true elevation. But that’s okay. There are no laws about this! When you get back to your computer, look over your photos and decide which one you like best for showing how your elevation(s) will change; not that you’ll modify the photo itself in Ez-Architect. But you’ll be making a sketch of it. Modify the photo, if you feel the need, in any photo editing program (like Irfanview, for example). Save your photo as a jpg, jpeg, tif, tiff, png, gif, or bmp. Be sure to remember the name of the folder where you save it. Start a new Ez-Architect plan. Open a second layer. Call it Photo (or whatever you prefer). Use the Library/Image Tool (lower left corner of the left icon group). Drag an outline and a dialog will open. Use the lower dropdown and select the file type of your photo. Then navigate to the folder where you saved it. Select your photo file to insert it into your plan. Stretch it appropriately so that it has the same aspect ratio as your original (as your house, that is). That means you want to make it look as much like your real house as possible; don’t stretch it too wide or too tall. Create a new layer. Call it Sketch or whatever you like. Then go back to the photo layer and choose Layout/Layers/Disable Selected. This will change your original photo to gray scale. Add the Sketch layer by clicking on Layer 2. You’ll still see your gray scale photo. But when you start sketching you will only be drawing on Layer 2. Draw as much detail as you like. Draw enough detail so you can (next step) change the sketch adequately to clearly show the changes you’re planning Don’t go into too much detail; do just enough so that you can easily modify the sketch and still have useful “before” and “after” sketches. Now that you’ve got your photo sketched on its own layer, add another layer. Call it New View or whatever. Select Layer 2 (your first sketch), and now disable that layer. It will turn gray. So when you select Layer 3, you’ll see your gray scale photo and your gray sketch. I suggest that you un-select Layer 1 so that your photo doesn’t show up at this point. You can leave it if you wish, but you might want to keep what you’re seeing as uncluttered as possible. So guess what’s next. You’re looking at Layer 2 which is disabled (gray) and you’re about to draw on Layer 3. Start drawing your modifications by using Layer 2 as a guide and take off point. Let me know how this works for you. Keeping layers separated can be tricky. So if you don’t see gray when you expect to, just select that layer only and click Disable and it will change to gray once again. Have you Used your Ortho Today? Truth is, I recently learned the term “ortho” from a customer. I didn’t do any research on it. But the customer inquired about how to find this tool in Ez-Architect. I wrote back and honestly said I didn’t have a clue what it was. The reply described a tool that would draw straight lines East, West, North South, without a struggle. If you haven’t made use of this handy tool in Ez-Architect, you’ll want to do it soon. It will make much of your drawing quicker and easier. First our ortho lines go in eight directions. Not just the 90 degree angles, but 45 degrees as well. Not quite 45 degrees, a line may look like this. Perfectly acceptable if you need this angle. But what if you want 45 degrees. The perfect 45 degree line is smooth as silk in any resolution. Hold the shift key in line mode and your line will snap to these angles. You can also use lines with special ends, dotted, dashed or any type of line. Just press Shift while drawing! Easy! Have you used ‘ortho’ lines in your Ez-Architect plans? Or is this one of those things you wish you’d known a long time ago? You can share your Ez-Architect discoveries here. Ah, you might get confused when you start using dimension lines, especially if your lines have arrows on the ends. Here’s how it goes. Here’s a simple line without added dimension lines. Now it gets a little interesting when you add a dimension line. You see the plain line on the lower left, then dimension line above and to the upper right. It’s relatively clear what’s what, especially if you know that you’ve set dimension lines to be “below/right” in your preferences. Here “right” takes precedence. Add a dimension line to a plain line and it gets interesting. The double arrow without a dimension line. And now, the thrill comes when you add a dimension line to the double-arrow line. Here’s a double-arrow line with its neighboring dimension line. Which is which? You can select whether to have auto dimension lines or not (Yes/No). You can select how far they sit from the object. You can also decide whether you want to group them with the object or not. And for rectangles, you can have them in- or outside. Because these are not treated as one object, I can easily add distance between the dimension line and the object line. Of course, you can always ungroup a dimension line set should you need to. The line itself has a label, so a dimension line isn’t needed. Again, depending on what else you’ve got going in your plan, this can be very handy. You’ll find this line type at the bottom of the line palette. This is especially useful if you want to draw dimension lines that aren’t directly associated with one particular object. This line type always has some kind of end on it. So you’ll likely use it to set down measurements unrelated to individual objects. These line ends you see above can, of course, also be used with nondimensional lines. Just select any line thickness and then double click the line palette to cycle through the different types of ends. You’ve got two types of hollow arrows, two types of line arrows, slashes in two directions, ball ends and a lovely “X.” What more could anyone ask for more! Have some crazy fun with lines! You are currently browsing the archives for the Ez-Architect category. Will your Mac run our OS-9 Software?